India has now crossed 2 trillion mark and racing towards becoming 3 trillion economy. According to the data released by the World Bank, India's GDP crossed 2 trillion dollar mark in 2014 and now stand at 2.6 trillion. 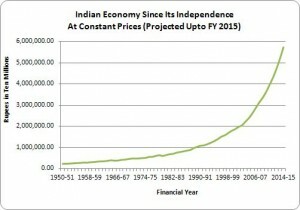 Remarkebly after taking 60 years to reach the $1-trillion mark, India has added the next trillion in just seven years. India is still in the lower middle income category.India’s gross national income per person has risen to $1,610, which converts to Rs 1,01,430 by present exchange rate. Despite its increase in per capita gross national income (GNI), India has remained in the ‘lower middle income’ category ($1,046-$4,125).The report also shows that India would become an ‘upper middle income’ country ($4,126-$12,735) in 2026. This will put it in the category China occupies now. But, it will take India till 2039 to reach the ‘upper middle income’ level, at the assumed growth rate. The World Bank’s data on gross national income per capita show Bangladesh, Kenya, Myanmar, Tajikistan, Mongolia, Paraguay, Argentina, Hungary, the Seychelles and Venezuela have shifted their income categories for the better. For example, Bangladesh, Kenya, Myanmar, and Tajikistan are now ‘middle income’ countries from being ‘low income’ nations. The Gross National Income (GNI): The gross national income (GNI) is the total domestic and foreign output claimed by residents of a country, consisting of gross domestic product (GDP) plus factor incomes earned by foreign residents, minus income earned in the domestic economy by nonresidents . (All figures in millions of US dollars).Comparing the GNI and GDP shows us whether the nation resources are put to capital creation or declining toward abroad.